We have some big news around here an I am so excited to share it with you, dear reader. As you may recall, I enjoy having a bigger-than-typical family. Our crew of four boys brings me joy and I am grateful for them all and the (mostly) delightful chaos they bring into our home. Some well-meaning friends have suggested we get a dog to add to the mix. Hilarious. We are not getting a pet (beyond the beta fish that has miraculously survived longer than its three departed predecessors). There is no cat, hamster, or guinea pig on the horizon. We went in a different direction. Five of us were on board with this decision right from the start. It took some convincing, but eventually my husband saw the wisdom of procuring our new family member. Please help me welcome, Big Bag of Chocolate. So glad we captured this precious moment. The whole family helped with the selection. Christmas – such a magical season. Cozy winter nights are perfect for reading with loved ones. I would have shared the blanket, but melting is a real concern. Hobbies are more fun when you share them with family. Almost forgot how to do a sling. Almost. Always ready to ruin things with healthy options, my husband. Happy holidays! May your season be chocolate-filled. Did I have to dress as a glamour shot from 1986? No. Was I asked to choose a theme? Also no. Posing for the “silly” staff photo. Dancing in front of anyone over age five and non-family. Deciding what time to meet up. These are some of things that stress me out. It might be hard to top last year when our family went as the controversial yet festive Starbucks red cups. Or the year before when I made my own because I am super crafty and very talented with a glue gun. I thought about going as the Ghost of Christmas Past, but then realized that wearing a shredded bed sheet could hamper my gift exchange competition level. Reader, I know this is beginning to sound like a movie plot, but the email was not creepy. IT WAS ACTUALLY HELPFUL. 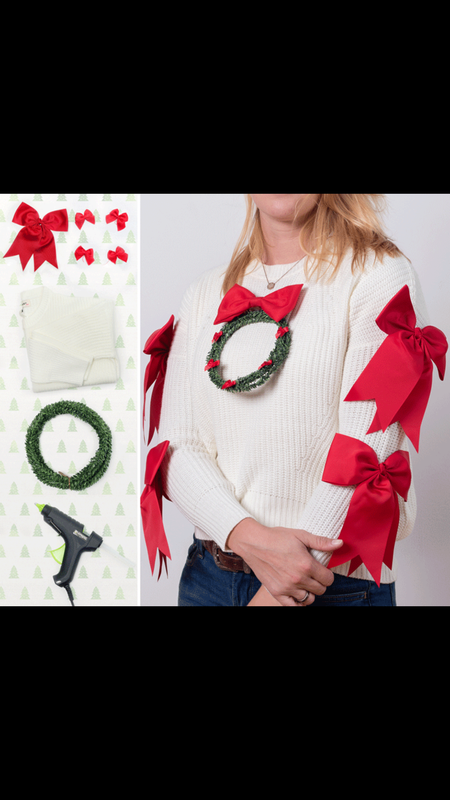 Dropped directly into my inbox was the solution I needed: sweaters I could make myself (successfully) using my glue gun, scissors, stencils, and bows. It was this former kindergarten teacher’s dream project plan. Click here to peruse the options and let me know what you think in the comments. I have my glue gun primed and ready – game on. Decorations and softly glowing lights, friends and laughter, and anticipation of the magic of Christmas morning. Every December memories come flooding back. I loved slowly going through the Sears Wishbook and carefully writing down my hopes for gifts: a Slinky, Miss Piggy Baby, Monchichi, Cabbage Patch Kid, a Care Bear, a diary. As the holidays approached, our house transformed into something magical. Some of the decorations have long been given away and replaced, but when I think of Christmas growing up, I picture the tinsel garland my mom hung over the front hall mirror, the reindeer stuffies perched around our family room, and the red felt stockings hung on the fireplace. I remember a steady flow of visitors dropping in, the white noise of conversation, the small metal candy dishes filled to the brims. And of course, the glow of flickering flames during the Christmas Eve candlelight service, my favourite service of the year. A week or so before Christmas every year a special package would arrive from Minnesota. We never knew for sure what the contents would be, but they always included Hershey Kisses (you couldn’t get them in Canada back then) and some fun homemade decoration with a newsy letter updating us on all things Minnesotan. You see, years before, a young couple with two small children decided to reach out to a Canadian family in need at the Mayo Clinic. The backstory is not my story to tell, but they (among others) provided support and stability to a young patient when her parents couldn’t be with her as she received treatment. A friendship that spanned years began. Fast forward to my adulthood. Through social media I have met lovely people from all over. One Christmas not long ago a package arrived from Rochester, Minnesota from a family I had befriended (or they befriended me. Either way, we became friends). Inside was a bag of American Reece’s Peanut Butter bells and Rubik’s Cubes for our four boys. Seeing the return address made my eyes leak and my heart leap at the connection. But wait, there’s more. The sender worked for…the Mayo Clinic. Your memories are different from mine. And the memories we create now with our children are different again, too. Our family has traditions now that weren’t possible when I was young. We send and receive cards and packages to and from all over the USA. We have received dozens of packages of Oreos and M&Ms from them, too. Each year since the “Rubik’s Cube Christmas” our list of “friends we have yet to meet in real life” grows. And it is amazing. As we put up our tree this year I set aside some ornaments that I wanted to hang myself. They hold a special place in my heart as a representation of my internet people and a reminder of how sad things can be turned into the fondest of memories. Local mom was shaken to discover her family home had apparently been the victim of vandalism. “I love a good mystery. Scooby-Doo, Nancy Drew, Encyclopedia Brown, Sherlock, I’m a big fan of the sleuths. So I thought I would be able to solve this easily,” the mother of four said. Unfortunately, she was mistaken. The family recently put out their Christmas decorations, including a family favourite, the nutcracker, Bob. Days later, the family was horrified to find that Nutcracker Bob’s trumpet had been broken off. When asked about the vandalism, the oldest son declined to comment. The youngest son, however, speculated that the family home might be haunted. Similar incidents have happened to the family in the past. Toilet paper strewn across the floors, lights mysteriously left on, and chewed gum hidden behind furniture. Authorities have not been called in, but the parents are documenting the recurring vandalism. For the time being, the family remains hopeful that the mystery will be solved. I half opened one eye to peer at the alarm clock. It read 6:30. SIX THIRTY?! We have a standing policy that you pretend to sleep until seven. In an effort to stop this early wake up from spreading, I staggered to the Littles’ room to see what was the matter. “What! ?” I growled, discovering my throat was a dry and sore. “When’s it going to be morning? It’s taking sooo long,” said the four-year-old. As I turned to go back to my room I saw that Big’s light was on. Great, another one up early, just going to pretend I don’t notice. I stomped in quiet rage back to the Littles. Once again I snuggled in for just twenty more minutes. Moments later I heard the steps of Big creeping slowly to my side. “Leave. Mommy. A. Lone.” whisper-yelled Bearded Husband (my hero). Five minutes later Littles started bickering again, probably about who stole the toddler’s belly button this time. 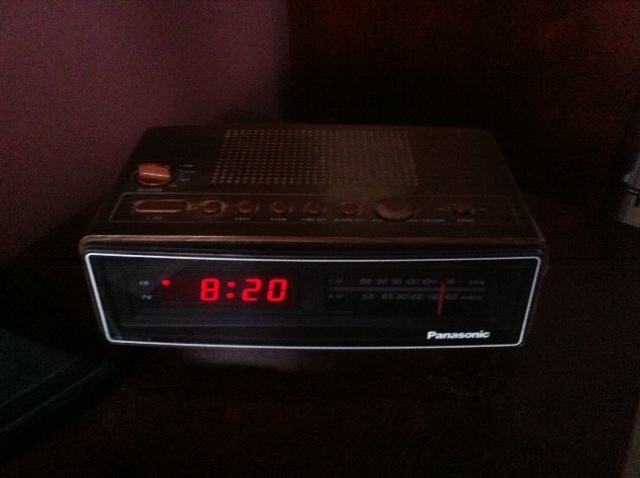 This alarm clock radio is older than I am. I am the proud owner of a plug-in alarm clock radio. To reset it you have to hold down multiple buttons. We’ve had a lot of power outages due to a recent ice storm. It flashes 12 until you fix it. Around midnight the night before, I changed the time. Turns out I set the alarm for the correct time, not the clock. If anyone is looking for a last minute gift idea, I might be in the market for a battery operated bedside clock.